I’ve started in on the pile of sock yarn that is in my “to do” list, the first up is a skein of Lorna’s Laces hand dyed yarn. It is a superwash merino and I couldn’t talk myself into getting my sock machine all set up just to pack it back up for an event tomorrow. 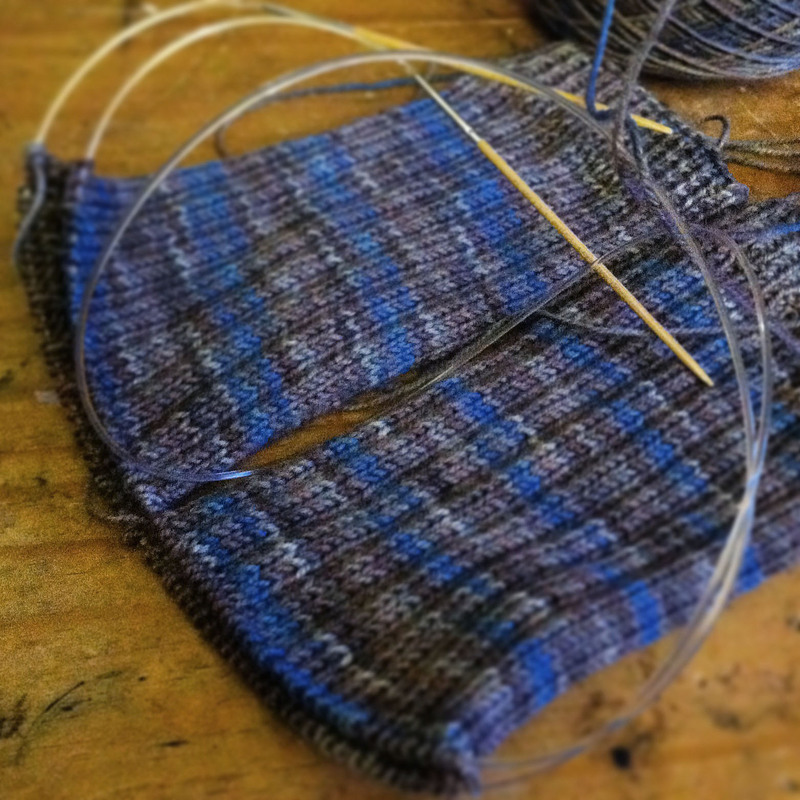 I cast on for two at a time and have been very productive, especially considering it is on size 1 needles. I was thinking about half way through the day that the number cast on for one sock (64) is the same as what I cast on for a child’s hat. I would have two hats done but this point, but nope I’m half way through two socks instead. The color is a great grey/blue with some brown in there too, I’m leaving the solid colors for the machine, they go faster and I stay entertained with the changing colors of the variegated yarns. When I started adding on the inches the blue looked like it would stay on one side and not stripe around the circumference of the sock. I panicked a little and then kept on going figuring that if it did that would look cool too. As it turned out, I am really enjoying the non-perfect stripes It is almost a spiral pattern but is broken up a bit, making it interesting but not too wild for a pair of socks for the office. Zach is eying the socks and I don’t blame him, I’ve been promising to make him another pair since I accidentally felted his Civil War socks in the wash. Tomorrow we will be at a Civil War living history event where I will be doing demos so it will be a perfect time to finish off a pair for him. That colour is so beautiful! Happy knitting.